Go inside the global economy with Stephanie Flanders in her new podcast, Stephanomics. Sign up here. Federal Reserve Chairman Jerome Powell has a mounting distraction as he tries to engineer a rare soft landing of the economy and extend a nearly record-long U.S. expansion: The man who installed him in the job wants no landing at all. President Donald Trump blasted the central bank on Friday for “mistakenly’’ raising interest rates and for a “ridiculously timed’’ reduction in its balance sheet. To hear the president tweet it, the economy would have expanded faster last year and the stock market would be higher if not for the Fed. Apparently he wasn’t happy enough with the strongest growth since 2005 and the S&P 500 Index’s best quarter in a decade. Trump’s remarks stood out because the Fed has already done what he requested over the past year: stop raising rates. With budget deficits ballooning and fiscal stimulus difficult to engineer with a divided Congress, the White House is now turning the screws on the Fed to open the monetary spigot in time to boost the economy going into the 2020 presidential election year. Soft-landing the economy — reining in growth with just enough rate hikes to forestall overheating but not trigger a recession — was never going to be easy. Ken Matheny, senior economist at IHS Markit’s Macroeconomic Advisers, likens it to a unicorn because it’s so illusive. The Fed arguably has accomplished it only once, in 1994-95, and then it was aided by a productivity surge that stretched the expansion into 2001. Trump’s criticism “doesn’t make the Fed’s job any easier,’’ Deutsche Bank Securities chief economist Peter Hooper said. “If there is any sense that the Fed is kowtowing to pressure from the administration, that’s a problem’’ because it calls into question the central bank’s political independence. The Fed is vulnerable on two fronts. First, the economy is slowing sooner and more than the central bank expected, though Moody’s Analytics chief economist Mark Zandi said that’s partly because of Trump’s confrontational trade tactics. 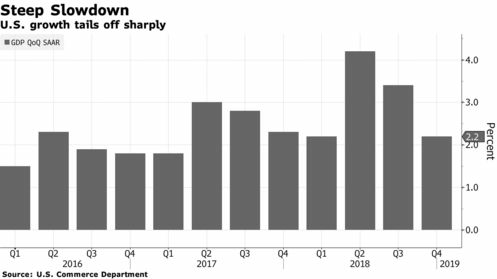 After downshifting to a 2.2 percent annualized pace in the fourth quarter from 3.4 percent in the third, growth is projected to have slowed further in the first quarter — to 1.5 percent, according to economists’ forecasts compiled by Bloomberg. Activity was weighed down by the since-ended government shutdown and a wobbly global economy. Secondly, inflation has failed to pick up as anticipated — a development that Trump alluded to in his latest Twitter attack. The personal consumption expenditures price index, the Fed’s favorite inflation gauge, rose 1.4 percent in January from a year earlier and has not been sustainably above its 2 percent target since that objective was introduced in 2012. The Fed has responded to lagging growth and inflation by abandoning plans to raise rates at all this year — a surprise policy U-turn that sparked the first quarter’s stock-market surge. But the administration wants more. Before Trump’s tweet on Friday, his senior economic adviser Larry Kudlow urged the Fed to reduce rates by a half percentage point. That followed a similar call from Stephen Moore, whom the president has said he will nominate to the Fed’s seven-member board. Those calls dovetail with financial-market expectations of a rate reduction. Click here for the full note. What Mistake Will We Make Next Time?